Pesticides, loss of habitat, disease, and climate change are putting stress on bees and there is a big push to raise awareness about the importance of pollinators to food security. 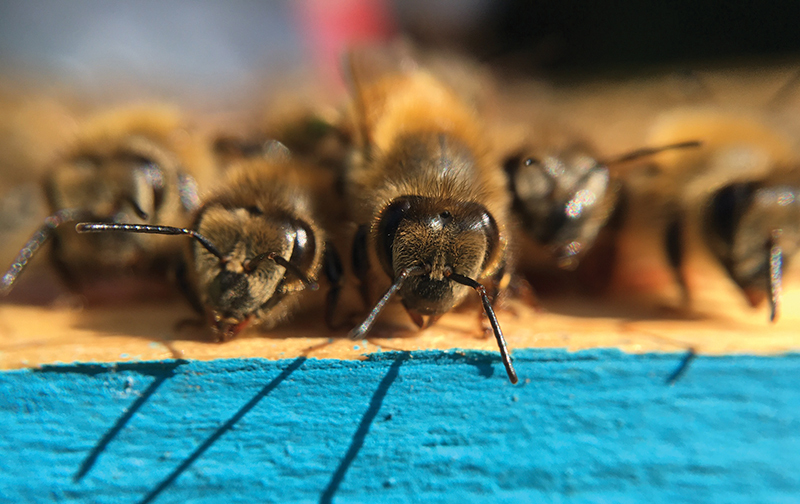 There has been a lot of buzz about neonicotinoids and other factors affecting bee populations. Bee Natural Caretakers is a community group of beekeepers who are committed to supporting and participating in a natural, sustainable, treatment-free beekeeping. Gray said beekeeping is exploding in popularity but people don’t have to keep bees to support the bee population. She became interested when she discovered wild honeybees living in a tree behind her Mulmur home, which led her to contact Ian Payne and together they started Bee Natural Caretakers because there was not another group like it. To their knowledge, the only treatment-free bee keeping group in Ontario and possibly in Canada. It draws people from all over the place and is growing quite rapidly. Most hobbyists have two to four hives and want to do their part to help the honeybee and put them back in their environments. The group shares expertise and tours members’ hives to see how others are managing their bees. For people who don’t have the desire or space to keep bees, they can support bees by improving habitat. People are encouraged to grow bee friendly plants like lavender and sedum. Go natural and let your grass and dandelions grow. The dandelion is the first substantial source of nectar that the honeybee has access to in the spring, says Brian Scott, beekeeper and owner of Innisfil Creek Honey. An entire colony of bees, on a hot day, can drink up to a litre of water or more a day, that’s what they need to produce wax, to operate the hive. Gray said there are so many ways to provide a continual water source, or bee bath, also for butterflies and other insects. They can’t land on water so they need a perch in a shallow dish of water so they can land and get a drink. A bee bath can be as simple as arranging marbles or rocks in a shallow dish and keeping it supplied with fresh water. 1. Be careful what you kill! I was stung several times on my property a few years ago, when I stumbled into what I thought was a hornetsʼ nest. They were nesting in the ground in the horses’ pasture and I sprayed them with a wasp insecticide. After I inspected the dead insects, I realized they were wild bees, not wasps, says Mono beekeeper Janet Grant. 2. Support local Ontario honey producers, and preferably buy organic or natural honey that does not contain pesticides or antibiotics. Read the labels to make sure it is 100 per cent honey, with no added corn syrup. 3. Incorporate honey into your diet, replace sugar with honey. It has many health benefits. Most of the sugar we consume is made from beets, not cane sugar. You can substitute honey in most recipes. 4. Teach your children about bees, they are amazing creatures. 5. Support organic, local farmers. Monocultures (vast acreages of a single crop treated with herbicides and pesticides) are killing bees. The crop may provide flowers for a brief time en masse, but then quickly leave the bees with nothing to eat. Small farms, with a variety of crops, hedgerows, flowering trees, forests, fields and marshes are a much better environment for bees to inhabit. 6. Be kind to the environment, bees need clean water, clean air, clean soil to thrive. 7. Do not buy plants or seeds treated with neonicotinoid pesticides. Big box purchases such as flowering annuals, ornamental plants and vegetables often are treated. 8. Plant a variety of flowers on your properties. Manicured grass is a wasteland for bees. 9. Make sure that the label says Ontario Honey. Buying local honey from a beekeeper allows them to have the money to look after bees and ensure their future in Ontario. 10. Buy honey and other hive products (wax, propolis) from a beekeeper you know. That way you can ask questions about their practices (if they use miticides, if they feed the bees sugar water or leave honey for the bees) and decide for yourself what kind of beekeeping philosophy you want to support. Sourced from Bee Natural Caretakers members.